Cambridge House recently hosted a Family Fun Night & BBQ to celebrate the official opening of the school’s new Strength and Conditioning Room. The facility was officially opened by Daryl Montgomery and Roger McBurney of Ballymena Rugby Club 1xv, Jamie Smith, former Ulster player and Steven Mulholland of Ulster, all former Cambridge House pupils. The Rugby Development Group were delighted to have such a great turnout for the event which provided the opportunity for parents, family and friends of existing rugby players and new Year 8 pupils to meet the coaches and see training drills and practice matches for Junior, Medallion and Senior teams. 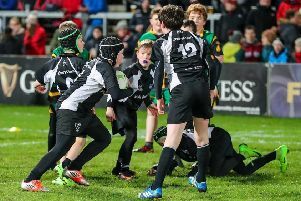 The Rugby Development Group, comprised of a number of parents of pupils and school coaches, are looking forward to continued parental support for the season and for future rugby development events. The Family Night also included games and rugby competition activities for guests which were greatly enjoyed by all. Cambridge House has a long history of success at developing rugby talent and the Rugby Development Group plan to organise further events throughout the season to continue raising the profile and development of rugby in the school. The Group has also thanked a number of local businesses and organisations including Style & Sport, Ballymena Rugby Club, Montgomery’s, Ulster Maid and News Rack. Thanks also go to Moore Electrics for the provision of a music system.